We had a number of avocadoes ready to be used; I made my guacamole by mixing avocado, lime juice, garlic, onion, and rosemary. It was great! 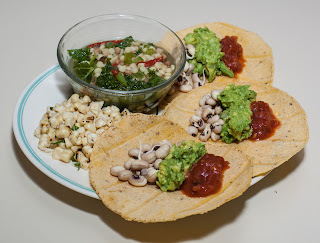 I found that my wife had soaked some black-eyed peas, and I thought this would be a unique and interesting basis, along with the guacamole and salsa (and vegan cheese on my toddler's serving) atop some warmed corn tortillas. Like I described when I first purchased fregola sarda back five years ago, this "Sardinian Couscous" is easy to prepare, simply by boiling for 14-17 minutes. I decided to make a soup by boiling with a cube of vegan bouillon, along with about 4 large leaves of kale that I had hand ripped into bite size pieces, and about 1/5 of a medium bell pepper, diced to about 1/4" cubes. I also served some corn-off-the-cob with a little lime, Earth Balance margarine, and a bit of a nice mixture of herbs and sea salt. A few weeks ago at a Triangle Vegetarian Society potluck dinner, I met Zacki Murphy, a local caterer, who has created a Mediterranean blend of sea salt and herbs; this is what I used today. Everything was good! I'd love to get more of the fregola sarda and experiment with other dishes with marinara or other sauces. I was shopping at Whole Foods Market today and happily came upon a person sampling West African sauces, all vegan, from a new company in nearby Raleigh, called Kitchens of Africa. The company is the brainchild of an immigrant from The Gambia. I sampled a tasty Maffé peanut simmer sauce - wow! It was quite flavorful and just spicy enough with a nice afterburn of habanero. The sauce consists of water, peanut paste, tomato, lime juice, tomato paste, scallion, onion, ginger, garlic, sugar (I'll bet it would have been just fine without the sugar), salt, canola oil, spices, and habanero pepper. They also had a carmelized onoin sauce that was okay, but didn't compare to the peanut one. The nutrition analysis isn't bad; for each quarter cup serving (about 1/6 of the 12 ounce bottle), there is a reasonable 5g of fat with no trans-fats (there is a half gram of saturated fat, which comes from the peanut). It even includes a gram of fiber - but, alas, has a whopping 320mg of sodium. I would love to see the product reformulated to include brown rice or maple syrup, instead of sugar, or with no sweetener at all. I definitely would like to see it with no added salt. I took about three leaves of red and three leaves of green kale, rinsed them, and roughly hand tore off bite-sized chunks. The stem is nutritious and, were I doing some sort of sautee, I would have used them. Instead, I saved the stems for making vegetable stock. I already had a half sweet potato that had been baked and was saved in my refrigerator. I cut it into 1/4" or so cubes. I brought a large stock pot of water to a boil and added the kale, as well as a handful of washed baby spinach leaves. I also added the sweet potato, not to cook, but just to get heated up. After a minute or so, with the kale's color darkening, I added fettucine-style wide rice noodles (I usually prefer to use brown rice noodles, but just had white rice noodles on hand, so used them), estimating how much my toddler, wife, and I would eat. The noodles only take a minute or two of cooking; once they were cooked, I drained the pan and served on plates. I put four or five tablespoons or so per serving of the simmer sauce in a small pan and heated it briefly over medium heat, then poured atop the serving (I envisioned serving this based on how the food demonstration was setup, with the sauce put on top of some rice; I will try another dish soon with the sauce indeed serving as a simmer sauce). I sprinkled a tablespoonful or so of shelled hemp seed on top - hemp seeds are great for omega-3 fatty acids, calcium, fiber, and more - and they taste good! 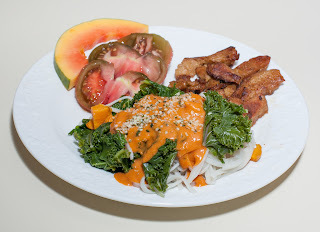 I also made my jerked limed seitan (I marinated seitan strips in freshly squeezed Meyer lemon juice, drained the juice, then sauteed in a little bit of oil till crispy on both sides; I mixed in some jerk seasoning) that we love, and cut some slices of tomato, along with a slice of tasty papaya. Yum! Dinner didn't take long and was tasty; my toddler enjoyed her noodles without the sauce (too spicy for her) and the seitan without the jerk seasoning. 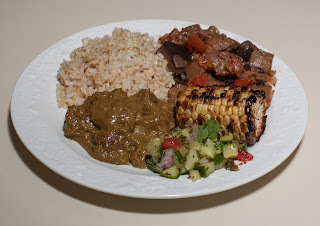 I hope soon to make a variant on recipes I picked up at the sampling for a vegan Maffé and/or a coconut-curry sauce. I'm delighted that I found this tasty sauce! For dinner today, I thought I'd try the low- or no- fat way of sauteeing vegetables without oil. I've occasionally done this with water, but today tried it with broth. I put about a quarter cup of water into a stock pot, and added a vegan bouillon cube. I gently heated the water and mixed the cube in, forming the broth. I briefly brought the broth to a boil, then reduced heat to medium-high, which kept the broth under a simmer. I chopped about half of a sweet onion into quarter inch cubes and started "sauteeing" them over the medium high heat. The onion, after about 3 or 4 minutes, started indeed carmelizing like they would if cooked in oil. But before that point, after about 2 minutes or so, I added a carrot, cut similarly. I let the carrots and onions cook for another 5 minutes or so; I added another 1/8 cup or so of water, and about a half cup of broccoli florets, halved or quartered, depending on their size (cut to a target for an appropriate mouth feel). I cooked another few minutes till the broccoli's green color darkened. I mixed in a little fresh lemon sage and some dried oregano, plus a pinch or two of salt. 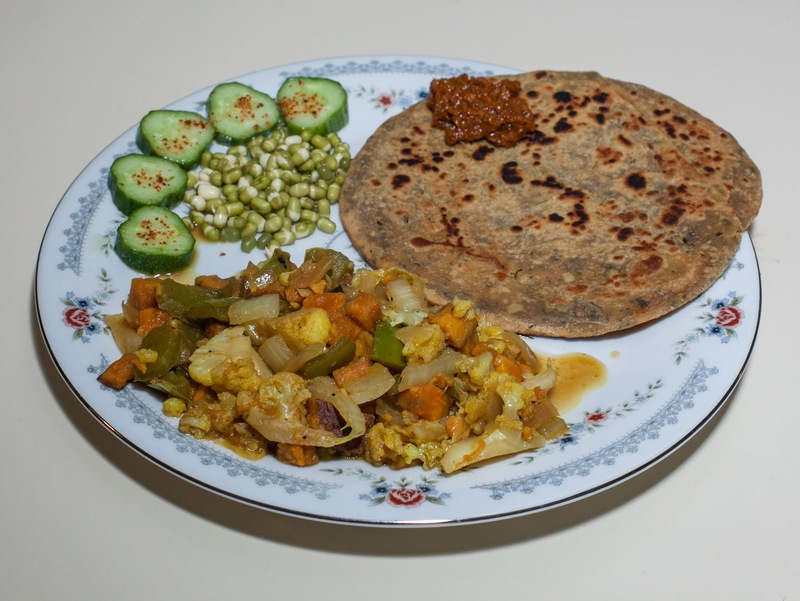 Were I not cooking for my toddler, too, I might have added some fresh jalapeno pepper or hot sauce (I did add some hot sauce to the served portions for my wife and me). I had separately sauteed, in a little bit of oil, about half of a package of tempeh, cut into 3/8" or so cubes. I mixed the tempeh in to the vegetable dish, as well. 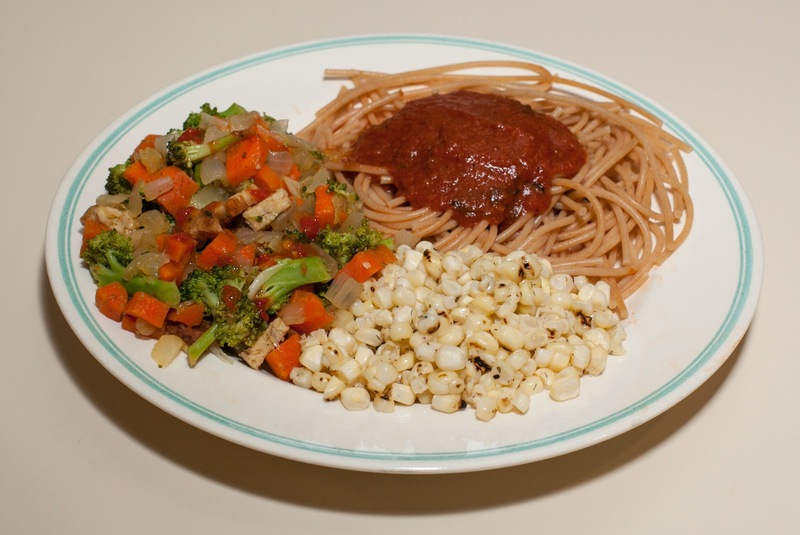 I served the vegetable dish, along with corn-off-the-cob (with a little Earth Balance margarine and touch of lime juice), and whole wheat pasta topped with a garlic marinara sauce, which I had simmered with fresh basil and nutritional yeast. Dinner was good! The vegetables were better than might be expected, sauteeing with broth instead of oil. Yay! Yesterday, I was busy preparing three trays of my chocolate baklava (not low fat!) for a bake sale, so my wife picked up some South Indian food for our dinner. The baklava came out well!